A social entrepreneur, philanthropist and development activist, Prashant, has been making efforts to bring positive change in his country Nepal through a variety of citizen initiatives. He is a strong advocate of, and believer in green future of Nepal as his country is blessed with immense green resources. He sees the lack of societal peace and harmony as the biggest threat to his country’s prosperous future, and is actively involving the country’s citizens, particularly its youth to build Sadbhaw (harmony) among the various strata and ethnicities of his country. 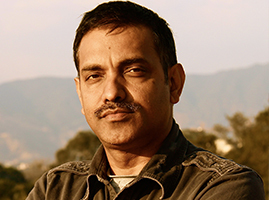 He founded Himalayan Climate Initiative (www.himalayanclimate.org), a not-for-profit organization in 2011, and has been serving as its full-time CEO without seeking any salary or benefit from the organization. Prashant sees the environmental too significant an agenda to be left to the environmentalists only. He advocates for embracing Nepal’s Private Sector and youth as active stakeholders in the country’s development discourse and actions.